Michelle Russell is the author of the fascinating book “From Tennessee to OZ” and it’s upcoming sequel. 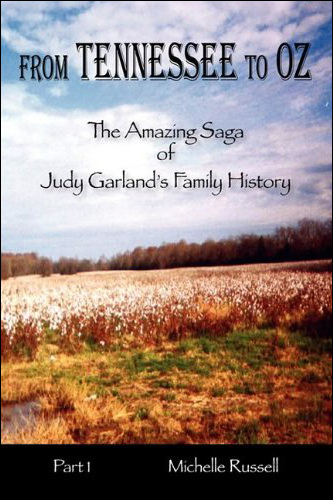 The books cover Judy’s genealogy as far back as possible. In fact, Judy doesn’t appear until the upcoming second book – the family saga is that rich in American history. Michelle was kind enough to answer the following questions. The Judy Room: Thank you Michelle! The first thing I ask a person is: When and how did you become a Judy Garland fan and what was it about her that first attracted you? M: Like millions of other people, I first saw Judy Garland on the yearly television showing of “The Wizard of Oz” and was fascinated. Not long after that, I saw her weekly television show which my mother liked to watch on Sunday nights. My mom was the one who told me that she was the same person who had played Dorothy. There was something very simpatico about Judy that attracted me. The final thing, a few years later was seeing the clip of Judy singing “Dear Mr. Gable – You Made Me Love You.” I was about the same age that she had been when she filmed it and I was hooked. I had never heard anyone – especially a young person sing like that. After that, I wanted to see everything she had done and know about her – though I would say that developed over the next several years. As with everything that’s happened in my knowing about Judy – one thing led to another. JR: Some people might think, “Why Judy’s genealogy before her birth? What’s so special about that?” Can you tell us what first attracted you that part of her genealogy? M: Well, again, this was not something I set out to do… to begin with. I was always fascinated with her beginnings and I wanted to see where she had been born. The first year I went to Grand Rapids, I met a woman who had lived with the Gumms and taken care of her when she was three, Wilma Hendriks Caspar. Wilma was a wonderful woman and she and I just hit it off. Meanwhile, I took a trip down to Murfreesboro, Tennessee (right after 9/11) to see what Frank Gumm’s hometown was like and what his musical roots were. Finally, after producing the album and a show that we performed for several years in NYC and NJ, people kept bothering me to write a book. I was absolutely not interested in writing a book, but after making a small book of photos as a Christmas present for Liza one year, I decided I could easily do something small and preserve all the stories I had collected. Sorry, this is long, but as I said, nothing happened directly. Meanwhile, while doing research on Frank Gumm’s family history which has been grossly neglected…I met a woman whose great grandfather was Frank’s mother – Clemmie’s brother and who had done 10 years of reseach. She was extremely knowlegdable and detail oriented… Together we discovered some really intense things – a story that even if it weren’t Judy Garland’s history would be fascinating.. She did not want to be co-author, but I could not have done all this work without her help, or the fact that for about 4 years I was able to work on it full-time. With the book I just kept going back in time because I had to get to the root of it all… excuse the pun. It is a story of America and a fascinating story, and I think in the long run will show Judy in a new light… and show her history in a new light. I’m sure some fans will pooh, pooh it as they are interested only in the show biz aspect of her life, but if you want a good story that ends with Judy Garland, this is it! JR:What have you learned about Frank Gumm and Ethel Gumm as a result of your research? Something perhaps we might not have known or thought about? And how has it effected (if at all) your feelings about them? M: Well, I’m sure that some people are going to see Ethel as a villaness forever, but I do see her in a different light. I have been so fortunate because I’d say that Judy’s extended family – people I didn’t even know existed, have opened their doors to me and their photo albums. If Ethel hated Frank so, why did she fly to visit his younger brother and the widow of his other brother in the 40s or 50s? She was also very thoughtful about Judy’s cousins, sending them birthday gifts and money. I’m sure she wasn’t perfect and made mistakes… like most parents. Even her brothers said she was pushy, but I don’t think people have understood her. Oh, yes, and she did have a temper, but I think everyone in that family had one! Everyone who met Frank said he was a wonderful and funny person. Part of his childhood was extremely difficult and sad. I understand better why he spoiled his daughter knowing how his father treated him. To be honest, I do have mixed feelings about him. There are so many rumors out there and none of it will ever be cleared up completely. The one thing you can say about him is that he was determined to be a good father and provide for his daughters and never, ever desert them. His death was truly a tragic and untimely event. I must say part 2 of my book will contain more information on Frank than has ever appeared anywhere, and more well-rounded information… I had no agenda – just finding the truth to the best of my ability. JR: What most surprised you when writing the two books? M: Well, I was surprised how deeply I got into history, but I realized that these people’s lives were intertwined with history and for instance, the pioneer ancestry and its affects went right up to Baby Gumm, just as the affects of the Civil War were with Frank and others. I also found that there is a thread historically that runs through people’s lives. Unfortuantely for the Gumms, substance abuse was a big problem, but the Baughs and Gumms were also extremely generous people, full of energy and also strong intellects. I thought my book would end where it begins, in Knoxville, but it gets close enough… ending in Kentucky when Judy is entertaining the troups and has a reunion with her Tennessee relatives. I was also surprised to learn how deeply connected people were – I never knew how Frank kept in touch with his Tennessee relatives, or that Judy sang in Tennessee as a toddler and that Judy also knew her Tennessee cousins. I guess you could say my book is more personal because I have more of the personal life that other writers have brushed over… pleasant things. JR: Speaking of which, can you tell us a little about your upcoming book? M: Well, I am in the midst of editing it… and it’s going slower than I had hoped. It begins in 1870…with the meeting of Clemmie Baugh and Will Gum (I should mention, spelled with one ‘m’ until after Frank left Sewanee). Then we get to a darksome place with Frank’s father… I have so much information on this period that I was able to write it almost as a novel and there are many direct quotes from family members. It is intensely dramatic. I hope I can capture the intensity I felt when I first read these things – my hair about stood up on my head! The reader will learn about Frank’s immediate family, facts that have been either hidden or unknown for nearly a century. My friend and I searched long and hard to find out about Frank’s sister. It took us years and eventually I went and stood where she died. I had to force myself to do it. Poor Mary. There are still some mysteries not solved here. I have attempted to fill in the information that has been missing until now – like where Frank went and what he did when he left Tennessee. Even now, I’m discovering new things. It is a BIG story… which is why I called it a ‘saga’. For the parts about Baby Gumm, I have some first hand stories which I believe have never been written about before and of her years 8 – 14, I also have some very unique stories which I believe will have the reader really feel for her and understand her better. There is just too much to say! You’ll have to read the book. I can’t wait until it’s all together so I can read the entire thing too! JR: Your books are rich in American history. Where would you place Judy’s story in the context of American History? M: Judy’s story IS American history. Her ancestors were pioneers… people who braved the wilderness and helped create the state of Tennessee. They forged the land, worked in government and were ministers. They fought in the Civil War and suffered its effects – in some cases lost most everything they had including health. At the turn of the century, like many other Americans they left the homeplace and began to branch out and try other forms of living and work. Some went into theater. Judy was the little girl from Grand Rapids, but deeply she was like Dorothy from Kansas. She achieved the American Dream, but in the process she lost a lot too – the entire family did, thinking fame and money would bring happiness. Judy left us the legacy of those dreams, and the artistry of true feeling and love. JR: How do you see Judy Garland and her legacy in the 21st Century? M: Judy Garland left us so young. It’s amazing to realize she’s been gone so long and some of her peers are still among us, but she did everything she had to do in her time. I guess you could say I’m something of a cynic. I have no idea how she will be viewed in the 21st Century. I am sure “The Wizard of Oz” will continue to live and be loved – Judy’s work in that film has made it unforgettable -something that every child and adult can relate to. Her work is so pure, sincere and deep – it touches the heart. I wish our society was a bit more authentic and basic….Judy Garland is a shining star in authenticity… she goes straight to the heart and that makes her work eternal – besides which there has never been a voice like that! Her artistry is unsurpassed. I truly hope people continue to learn about her work and treasure it. JR: The Judy Garland fan community is notoriously vocal. How has your book been received by them and how has that effected (if at all) the second book? M: Well, there are those who are interested in the book and those who are not. I guess there is no way of predicting how it will be met. In a way, I have to not care. I feel so fortunate to have met the people I have met. Many have now passed on. I made friends with some wonderful people who were friends with the Gumms, including Dorothy Walsh Morrison. I miss her and Glen Settle so much. Remarkable people who lived into their late 90s. They were older than Judy and so could have a more objective view of what was going on. Dorothy was incensed that after interviewing her, another writer did not include what she had to say about Frank’s death and funeral. She felt the writer sided with people from MGM, and he had not wanted to offend or disagree with them. Some of the things Dorothy Walsh said may be suspect, but she never changed stories. Even if every detail isn’t correct, I feel there is enough truth in the stories they should be passed on. That’s about the only thing I can think of people may protest on, but I’m sure they will find things if they want. A lot of books have been bought by people from Tennessee, so I’m hoping all sorts of people buy them and learn about what is in them. My job as a writer and historian is to preserve the information I have. As I said, it’s been my great joy, the adventure of a lifetime, to be able to write these books… but it’s like having a baby. At some point, the baby grows up and you have to let it go out on its own. You can’t control what people will say! Particularly not the Garland fans! JR: Can you tell us a little about yourself? M: Yes, I was born in Burbank – when I met Sid Luft, he was so funny. He asked me where I was born and then said, “I’ve never actually met anyone who was BORN in Burbank! My mother and grandmother were both in show business – dancers. My father was a singer, actor and producer as well. My mother later had a dance studio and wrote shows that she turned into musicals, so I grew up with the excitement of performance and performing myself. I attended LA City College and then moved to NYC where I studied at HB. I created one woman shows – then called Night Club Acts! For a time, I left it all to work in politics and for Congress. Then I returned to my dream of singing and NYC. I’ve produced several really good Cabaret Shows in NYC – besides my one woman show, I produced a show on songs from the films of Shirley Temple…and the other things I’ve mentioned here. Some things are now on YouTube, including scenes from the 1997 Living History at the Judy Garland Birthplace. The account name is Catsongpub1. In addition to my books on the Gumm family, I have a book on “Sabrina” my cat. My publishing site is Catsongpublishing.com. Part 2 will not be officially released until next year. We have a London distributor so they can be bought in the UK as well. Michelle’s book “From Tennessee to Oz” is currently available. Part 2 of Judy’s family saga will be released next year. Fascinating interview, Michelle. I look forward to reading the new book. Thank you so much for this fab interview! I am so glad that you took the time to share this with us! Yes, will look forward to the new book. I’ve really enjoyed the first one! Thanks Michelle! I may reread your first book just before your second one comes out so I’m up to snuff with it! You are so right–there is great history in Judy’s ancestors!! Very interesting, just whets our appetite for the new book. Hope it all goes well for you. Thanks for giving the Gumm’s (of which I am a decendent) their day. This really sounds fascinating and I am grateful for the time you took to make it happen. I am interested in Judy and TN, who knew you could pull it together? Thanks! I have been looking forward to Part 2 ever since finishing Part 1! Love the comment that “Judy IS American history.” Yes, her ancestors helped settle this land, and Judy’s contributions to American music are her lasting legacy. Great interview – and it will be a great book! evening and hope you will be coming to Tennessee for a visit soon. Wow, I”m just reading your email. Thank you. I hope the family reunion was great. So sorry to learn of the passing of some family members. Take care! I miss Tennessee. It’s a great place. Every year in autumn I get that homing pidgeon feel… I should be packing the car and cats and heading there. I hope it doesn’t change too much. I thought maybe someday fans would like to take a tour with all the events of the book!